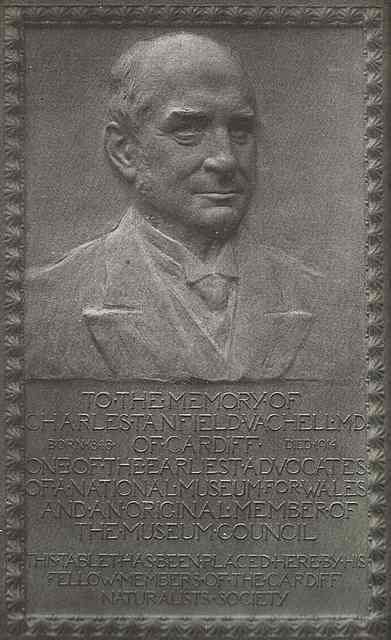 CHARLES TANFIELD VACHELL, M.D. BORN 1848. DIED 1914. By the death of Dr. Vachell the Society sustained a loss which requires more than a passing notice, for it may safely be said that its present position is largely due to his untiring interest and support. For over forty years an active member of its Committee, he acted as Honorary Secretary from 1875 for ten years, and was chosen President no less than four times (1885, 1891, 1892, and 1899). Its steadfast supporter almost from its foundation, he lived to see the Society grow and throw its influence over an ever-widening circle and it is not the least of Dr. Vachell's claims to the gratitude of his fellow-citizens that he left to the community a Society of which they may justly be proud. 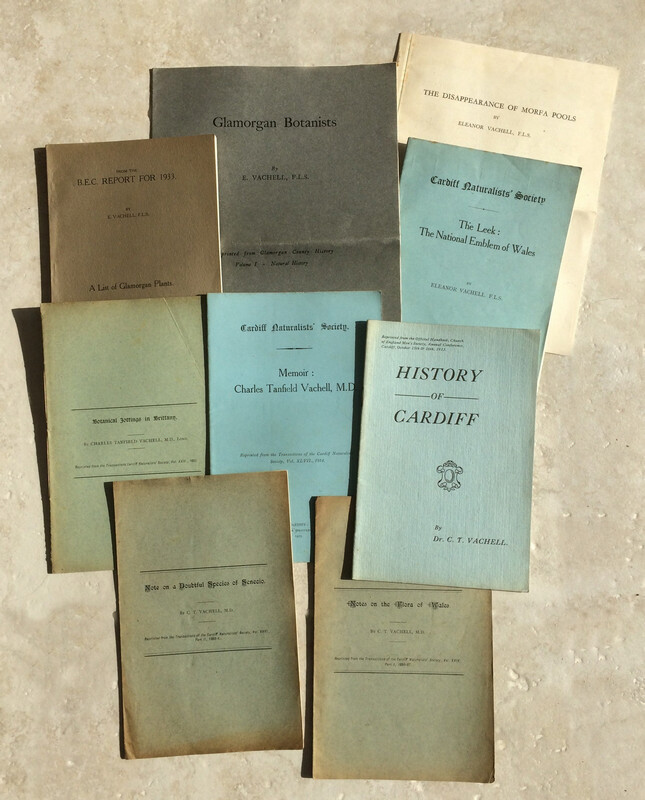 Born in Cardiff and descended from a family which had migrated to Wales from Reading, where it had been resident for some generations, Dr. Vachell was educated for the medical profession and took his degree at the University of London. From his boyhood he had been attracted to the study of field botany, and at Hereford Cathedral School, where he spent two years, he was fortunate in having opportunities of cultivating this taste which proved of great value to him in after life. When he settled in practice in his native town, he at once joined the Cardiff Naturalists' Society, and threw himself with characteristic energy into the furtherance of its objects. In 1871 four years after its foundation the Society had almost suffered shipwreck, and was rescued by the efforts of Dr. W. Taylor, who became the Honorary Secretary. He was ably seconded by Dr. Vachell, who joined the Committee in 1872, and took over the Secretaryship three years later. 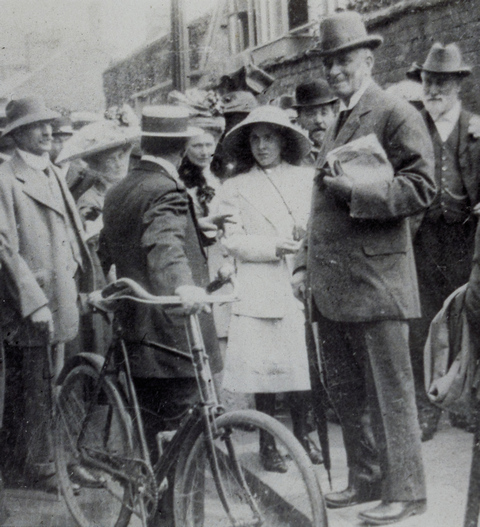 From that time, Dr. Vachell set himself to organise its work in supplying the needs of a large growing community. A convinced believer in the utility of the Society as an educational agent, he developed the system of public lectures which had been begun by his predecessor. Well versed himself in natural history and kindred subjects, he was ever mindful that their popular exposition was of great value to the community, and that the surest way to extend the influence of the Society was to make it the means of bringing them within the reach of all. In these early days the public lecture was in its infancy, and the lantern, as we now know it, was only coming into use for the illustration of scientific work. The Society's vicissitudes in its hunt for suitable lecturers in those days were not without their humorous side. Dr. Vachell used to relate an incident where a lecturer, unable to come at the last moment, despatched his assistant with lantern slides to deliver his lecture on Egypt." Reading from the notes, the substitute showed on the screen, to the no small amazement of the Society, what he called a group of pyramids and other wild animals." 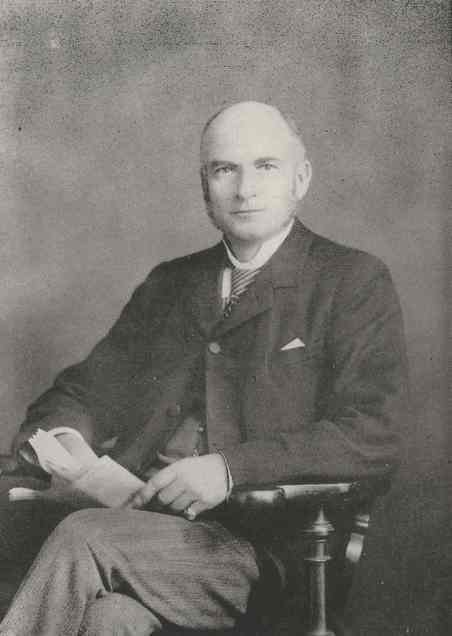 Upon the public lectures as part of the Society's work, Dr. Vachell laid great stress, and each year, when the time came round for selecting lecturers for the next session, he was full of suggestions which he had noted down for the consideration of the Committee. When a choice had to be made, he would not infrequently forego the pleasure of meeting and entertaining a distinguished lecturer - as he often did at his own house - if he felt that a less well-known man possessing greater power of exposition would reach a larger audience. By following this policy, the Society rendered good service to the community, and by securing as well the presence of well-known men of science and distinguished travellers on its platform, contributed in no small degree to the extension of its influence. Charles Tanfield Vatchell 10-08-1912 is that Eleanor next to him? From an early period of his association with the Society, Dr. Vachell was alive to the necessity of developing its practical side in the direction of sectional work, but he wisely felt that this step should not be taken until the Society itself was placed on a sure foundation and firmly established. When this had been accomplished, he took a prominent part, with some others, in 1887, in establishing the Biological and Microscopical Section the name was afterwards altered to its present designation, Biological and Geological Section. It was formed for the purpose of extending the sphere of usefulness of the parent Society to enable those interested in the study of biological and microscopical work to meet and interchange communications and specimens and to promote the special study and collections of the local flora and fauna. 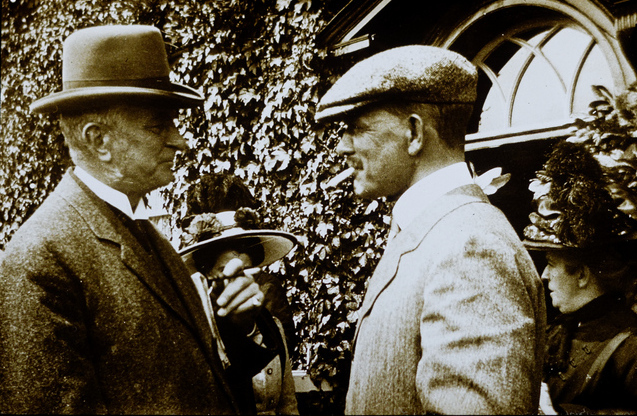 Appropriately enough, Dr. Vachell was chosen its first President, and he was fortunate in having associated with him Professor W. N. Parker as Honorary Secretary. This Sections excellent work soon justified its existence. and its present flourishing state is ample evidence of its value. He was always much interested in local meteorological observations, which had formed a prominent feature of the work of the Society since its foundation. He established recording instruments in his own garden, and took the daily readings himself regularly for over a period of thirty years. Dr. Vachell's interest in field botany was perhaps his chief recreation. Many of his annual holidays he spent botanising, and he was ever adding to his herbarium. He cultivated plants for the purpose of study, and was instrumental in having a botanical garden set apart at Roath Park. His knowledge of the British flora was very extensive, and of the Glamorgan flora very complete. He had long urged the Society to take up and expand Storrie's Flora of Cardiff," and it was with peculiar satisfaction he saw his proposals at length accepted in 1903 and a committee formed to undertake a Flora of the whole County of Glamorgan. For this work Professor Trow acted as editor, whilst Dr. and Miss Vachell undertook the secretarial duties. Circulars were issued to local botanists asking their cooperation in furnishing lists of the wild plants occurring in their respective neighborhoods. 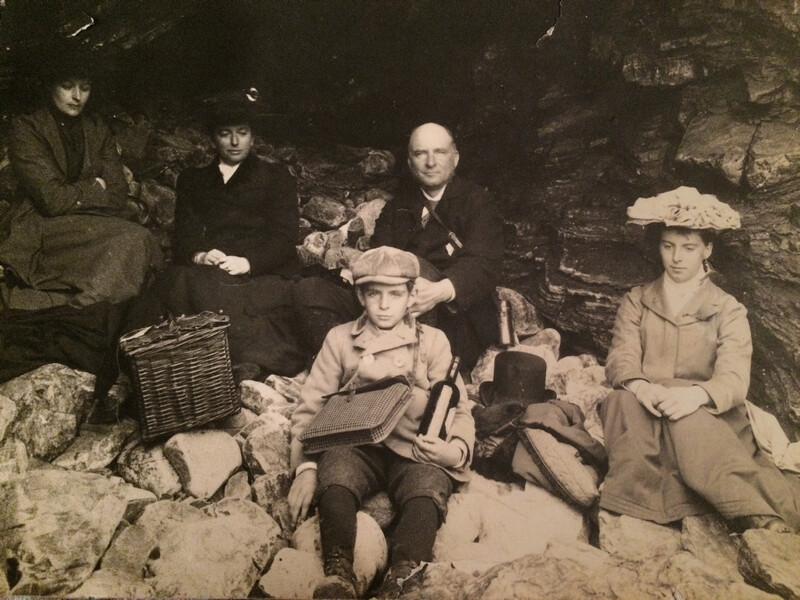 It is perhaps not generally known that Dr. Vachell and his daughter (herself an accomplished botanist) bore the brunt of the work, doing the whole of the correspondence with local contributors and collating and checking their returns, all of which involved enormous labour. The first instalment of the Flora was issued in Vol. XXXIX. of the Society's Transactions," and continued in subsequent volumes and the whole work was published in separate form in 1911. It forms a fitting tribute to Dr. Vachell's unceasing efforts, finally crowned with success. For 40 years he acted on the Management Committee, most of the time as its chairman. As in everything else he undertook, he devoted himself to it with his inexhaustible energy, and established a record of which any man might be proud. From the outset he showed broad and enlightened views of what a museum should be. An early advocate of a National Museum for Wales, he foresaw that in the inevitable battle for the site, the scale would turn heavily in favour of the place which offered a well-equipped collection as a nucleus. Hence the far-sighted policy of having collections, representative in all departments, and housed in a suitable building, was adopted by him and pursued tenaciously. As chairman of the Honorary Curators, he preserved an admirable sense of proportion in bringing the different departments to a state of completeness. When recommending various expenditures to the Museum Committee, Dr. Vachell was at his best. He was tactful, very persuasive, and the moderation with which he urged his points carried great weight. The collections grew at an unprecedented rate, and were hardly surpassed by any other provincial Museum. 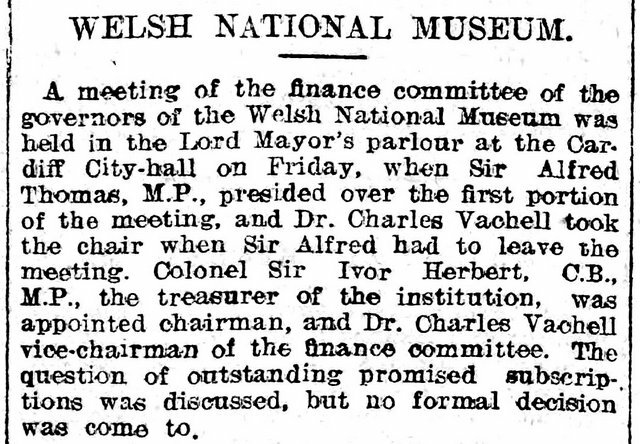 No one rejoiced more than he when Cardiff was selected as the site for the National Museum of Wales, and he had the satisfaction of seeing the patient effort of many years in which he played so prominent a part, crowned with success. 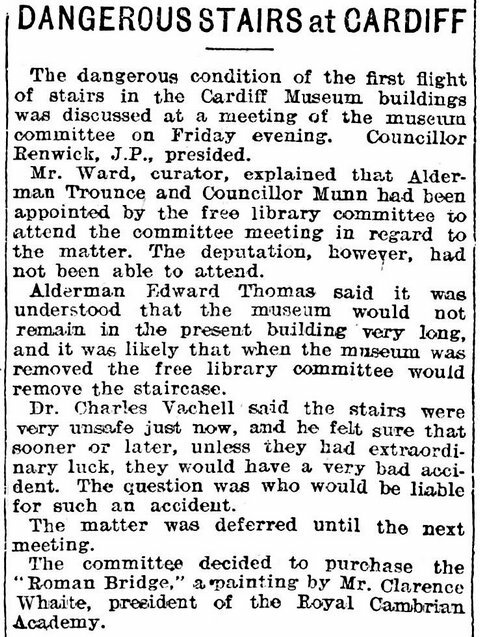 His services were fittingly recognised by his being co-opted a member of the Court of Governors of the National Museum of Wales at its first meeting in October, 1907, and being elected a Member of the Council in November, 1908. He served on many of its committees, and the records of the Museum show that he hardly ever missed a meeting. It is not too much to say that not one of the promoters of that institution brought more solid work into its promotion and development than he did. This notice would not be complete without a reference to Dr. Vachell's assiduous and valuable work on the Committee of the Society. In brief, his record is an epitome of the Society's history during the last forty years. He infused his own robust faith into his fellow-members, and his knowledge of the proceedings of the Society was invaluable in preserving the continuity of its policy. Ever ready to welcome fresh points of view, and sympathetic to any proposal in the nature of progress, he was able, from his long experience, to guide the Committee and to steer it clear of pitfalls. The flourishing condition and influential position of the Society are the best evidence of the value of his services; they were likewise his best reward. With Dr. Vachell's activities in other spheres of public life we have not to concern ourselves beyond a passing reference. Notwithstanding the demands of a large and important practice, he devoted much time to hospital work over a long period, and took his full share in the work of his own professional societies in which he sustained his close interest to the last. Social, philanthropic, educational, and other interests claimed their share of his attention. He was never idle, and throughout his life he was always ready to initiate any movement which might benefit the community, and no effort was ever wanting on his part to ensure its success and permanence. Possessing great personal charm and a dignified presence, his generous instincts and wide sympathies secured Dr. Vachell the confidence of his colleagues and made him a welcome member of public bodies. He detested faction in all its forms, and always based his actions on the broad ground of public policy, nor did he ever feel rancour if he failed to carry his point. Somewhat impulsive in early life, he appreciated in riper years the value of reculer pour mieux sauter (Withdrawing in order to improve one's chances of subsequent progress or success). Always a generous opponent, believing the other side actuated by the same honourable motives as himself, he typified the best traditions of English public life, seeking no personal advantage, but subordinating everything to the common interest. His public service over a long period, carried on without ostentation and often away from the public eye, leaves the community sensibly poorer for his loss.